This department is for the publication of informal communications that are of interest because they arc informative and stimulating, and for the discussion of controversial matters. The mandate of this Journal is to disseminate information relating to leprosy in particular and also other mycobacterial diseases. Dissident comment or interpretation on published research is of course valid, but personality attacks on individuals would seem unnecessary. Political comments, valid or not, also are unwelcome. They might result in interference with the distribution of the Journal and thus interfere with its prime purpose. The delayed-type hypersensitivity (DTH) response is employed as one parameter to assess the efficacy of antileprosy vaccines. The late lepromin reaction (Mitsuda type) is reported to correlate well with host resistance to Mycobacterium leprae (4,7,15). Such a reaction indicates the presence of delayed hypersensitivity to antigen, and means that the patient can mount a cell-mediated immune (CMI) response to M. leprae (14,16). Anergic lepromatous (LL) leprosy patients who are lepromin negative may shift their lepromin status, upon vaccination, to the positive side. The premise on which vaccines could be tested for their therapeutic efficacy is the induction of lepromin positivity in lepromin-negative individuals. Such studies are carried out in nonhuman primates before human trial due to their phylogenetic relatedness. Leprosy has been successfully produced/acquired in monkeys (6,17) like human beings, hence lepromin-negative monkeys have been employed in the present study to evaluate the DTH response of a gamma-irradiated antileprosy vaccine, M. habana, against M. leprae antigens. The experiments were conducted in Indian rhesus (Macaca mulatta) and langur (Presbytis entellus) monkeys weighing 4-6 kg and initially found to be lepromin and tuberculin negative. These monkeys were vaccinated intradermally (i.d.) with gamma-irradiated M. habana (60 cobalt source at 300 Krads) at a dose of 1.5 mg moist weight of bacilli ≅ 63.3 μg protein or 6.27 x 108 acid-fast bacilli (AFB) per animal. Normally, 4 weeks after vaccination these animals were challenged with Mitsuda lepromin (1.6 x 108 bacilli/ml) on the volar surface of the forearm. The test site was identified by tattooing India ink around the spot. The DTH responses were recorded at 4 weeks after lepromin challenge, and an induration > 3 mm was denoted as a positive Mitsuda reaction (10). A series of experiments were performed to study the DTH of this vaccine. The first experiment of the series was performed in 16 lepromin-negative rhesus monkeys, 13 of which were vaccinated and 3 of which were kept as unvaccinated controls receiving placebo only. These animals were challenged with lepromin on the 28th day after vaccination. After the first vaccination and lepromin testing, the lepromin-negative monkeys were revaccinated with the same doses of vaccine after an arbitrary period of 7 months and again retested with lepromin. In the second experiment, four lepromin-negative monkeys were vaccinated i.d. with the same doses and challenged with lepromin after 28 days. The lepromin-positive indurations of these monkeys were biopsied and examined histopathologically. These monkeys were revaccinated after 7 months and retested with lepromin. The third experiment was conducted in 8 lepromin-negative Indian langur monkeys, 5 of which were vaccinated and 3 of which were kept as controls on placebo. The experimental groups of monkeys received four vaccinations and lepromin testing after each vaccination. A leukocyte migration inhibition test (LMIT) was conducted with sensitized viable (95% viability) peripheral blood cells obtained from vaccinated as well as normal animals of the control group. Two antigens, lepromin [Dharmendra containing 1 x 107 bacilli (11), obtained from U. Sen Gupta, JALMA Institute for Leprosy, Agra, India] and habinin (prepared from M. habana on the lines of Dharmendra antigen) were used in the LMIT. The percent inhibition was calculated on the basis of the values of areas of migration with or without antigen. An inhibition of 20% or more was considered significant. (9). Intradermal vaccination with gamma-irradiated M. habana led to the formation of local ulcers like those produced by BCG which healed in a week to 10 days' time. 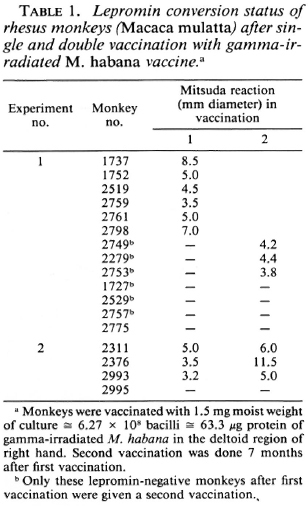 In the first experiment with rhesus monkeys, the initial vaccination led to Mitsuda pos-itivity in 46% of the animals. After a second vaccination, 69.2% of the animals were Mitsuda positive. 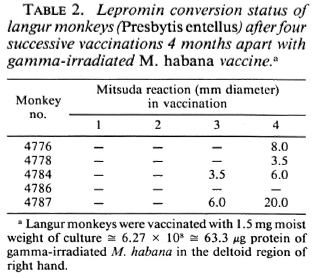 In the second experiment with rhesus monkeys, 75% of the animals became lepromin positive after the first vaccination, and after the second vaccination, the previous lepromin-positive animals showed a strong Mitsuda reaction at the test site, but the one lepromin-negative monkey remained negative even after the second vaccination (Table 1). Two successive i.d. vaccinations did not change the immune status of the langurs, and they remained lepromin negative. The third and fourth vaccinations produced 40% and 80% Mitsuda positivity, respectively (Table 2). The control groups of animals receiving placebos throughout remained lepromin negative. The lepromin-positive status of these animals was retested after 1 year and 1 ½ years of the initial vaccination. They were found to be lepromin positive up to 1 ½ years after the initial vaccination and will be followed further. The Mitsuda-positive granulomatous nodule on histopathological examination revealed a fairly abundant number of lymphocytes, epithelioid cells, and a few neutrophils. The appearance of the nodule was more like a tuberculoid granuloma. Only lepromin-negative rhesus and langur monkeys were included in the study, hence his-topathology prior to vaccination was not done. There was 46.25% and 35.93% inhibition of migration of sensitized leukocytes with homologous (habanin) and heterologous (lepromin) antigens, respectively. The un-sensitized leukocytes from normal animals before experimentation did not show any observable inhibition of migration, indicating that vaccination with M. habana induced the CMI responses in the monkeys. Monkeys generally have been found to be lepromin negative, and their lepromin negativity does not have the same predictive value for susceptibility to lepromatous disease as is the case for humans. It is obviously not clear why many presumably unexposed humans have positive lepromin tests, while unexposed monkeys do not (1). The vaccination-induced lepromin positivity in the individual monkey is considerably variable but leads to the conclusion that cross-reactivity does exist between M. habana and M. leprae. This finding is in accordance with the observations made by Chirmule, et al. (2) who also showed that administration of a single dose of the ICRC vaccine brought about Mitsuda lepromin positivity in 80% of their langur monkeys. However, in our observations, single and double doses of M. habana vaccine could not produce any change in the lepromin status of our langur monkeys. This possibly may be due to the individual immune status of the monkeys, because all of our langurs were initially lepromin negative while 3 out of 8 monkeys used by Chirmule, et al. (2) were Mitsuda positive before vaccination. M. habana also has strong cross-protectivity against M. leprae (13) (ICRC does not), therefore cross-reactivity in DTH responses may not be due to only group antigens but may be due to some more common antigenic determinants with M. leprae. In other studies it has been proven beyond doubt that M. habana shares some common and specific epitopes with M. leprae, particularly with regard to the 65-, 35-, and 18-kDa protein epitopes. It has the same class of heat-shock proteins as does M. leprae (8,12). The Mitsuda-pos-itive DTH response provides additional proof of its antigenic relatedness with M. leprae. Mitsuda-positive granuloma histologically revealed tuberculoid-type granulomatous changes highly suggestive of similar granulomatous changes in human tuberculoid (TT) leprosy patients where the patient mounts a CMI response and bacillary elimination is fast. Use of a human dose of lepromin in monkeys possibly may be the reason for the lower DTH response, since animals require higher doses of tuberculin (5) and lepromin (1). The immune status of langur monkeys is not well known, but they are good animal models for several human infectious diseases (personal communications), presumably due to their immune status. The requirement of several doses of vaccine for producing lepromin positivity in langurs possibly may be due to their immune status at a lower profile, like severely immuno-depressed LL patients where five to six doses of BCG plus M. leprae vaccine are required to boost their immune status (3). The vaccine presently awaits the Indian Drug Controller's permission for human trials. 1. Baskin, G. B., Gormus, B. J., Martin, L. N., Wolf, R. H., Watson, E. A., Walsh, G. P., Meyers, W. M. and Binford, C. H. The lepromin test in rhesus monkeys. Int. J. Lepr. 54(1986)427-436. 2. Chirmule, N. B., Dec, M. G., Sirodkar, M. V., Deshmukh, R. and Chanderker, N. G. ICRC vaccine-induced changes in M. /cprac-specific cell-mediated immunity in langur (Presbytis entellus) monkeys. Int. J. Lepr. 54(1986)57-62. 3. Convit, J., Aranzeza, N., Ulrich, M., Pinardi, M. E., Reyes, O. and Alvarado, J. Immunotherapy with mixture of M. leprae and BCG in different forms of leprosy and in mitsuda negative contacts. Int. J. Lepr. 50(1982)415-424. 4. Curtis, J. and Turk, J. L. Mitsuda type lepromin reaction as measure of host resistance in M. lepraemurium infection. Infect. Immun. 24(1979)492-500. 5. Davis, B. D., Dulbecco, R., Eisen, H. N., Ginsberg, M., Wood, W. B., Jr. and McCarty, M. Cell mediated hypersensitivity and immunity. In: Microbiology; Including Immunology and Molecular Genetics. 2nd ed. Hagcrstown, Maryland: Harper and Row, 1973, pp. 560-561. 6. Gormus, B. J., Wolf, R. H., Baskin, G. B., Oh-kawa, S., Gerone, P. J., Walsh, G. P., Meyers, W. M., Binford, C. H. and Greer, W. E. A second sooty mangabey monkey with naturally acquired leprosy: first reported possible monkey-to-monkcy transmission. Int. J. Lepr. 56(1988)61-65. 7. Job, C. K.., Kirchheimer, W. F. and Sanchez, R. M. Tissue response to lepromin, an index of susceptibility of the armadillo to M. leprae infection-a preliminary report. Int. J. Lepr. 50(1982)177-182. 8. Lamb, F. I., Singh, N. B. and Colston, M. J. The specific 18-kilodaltion antigen of M. leprae is present in M. habana and functions as a heat shock protein. J. Immunol. 144(1990)1922-1925. 9. Ortiz-Ortiz, L., Zamacona, G., Garmilla, C. and Arellano, M. T. Migration inhibition test in leukocytes from patients allergic to penicillin. J. Immunol. 113(1974)993-997. 10. Ridley, D. S. and Jopling, W. H. Classification of leprosy according to immunity; a five-group system. Int. J. Lepr. 34(1966)255-263. 11. Senguita, U., Ramu, G. and Desikan, K. V. Assessment of the Dharmcndra antigen. II. Standardization of the antigen. Lepr. India 51(1979)316-322. 12. Singh, N. B. Characterization of M. habana antigens (in press). 13. Singh, N. B., Lowe, C.A.R.E., Rees, R. J. W. and Colston, M. J. Vaccination of mice against M. leprae infection. Infect. Immun. 57(1989)653-655. 14. Skinsnes, O. K. The immunological spectrum of leprosy. In: Leprosy in Theory and Practice. 2nd cd. Cochrane, R. G. and Davcy, T. F., eds. Bristol, England: John Wright and Sons, 1964, p. 156-182. 15. Thomas, J., Joseph, M., Ramanujam, K., Chacko, C. J. G. and Job, C. K. The histology of Mitsuda reaction and its significance. Lepr. Rev. 51(1980)329-339. 16. Turk, J. L. Cell mediated immunological process in leprosy. Bull. WHO 41(1969)779-792. 17. Wolf, R. H., Gormus, B. J., Martin, L. N., Baskin, G. B., Walsh, G. P., Meyers, W. M. and Binford, C. H. Experimental leprosy in three species of monkeys. Science 227(1985)529-531.